The Kids' College Almana : Why Should I Think About College (part 5) - What Are Career Centers? Every college has an office that provides students with information and advice about careers. At these career development or career counseling centers, you can find information about careers through many sources, including books and audio, video, and computer resources. These centers help you explore different career paths. You can learn about the different jobs that are available in various fields. You can also learn about the kind of preparation you need for these jobs. Your school’s career center, which may be in the guidance office or the library, may have access to software and Internet programs that can help you learn more about careers. Career testing and counseling can help you find out things about yourself that might be important when you choose a career. These services help you identify your interests and strengths. Through a combination of conversations, surveys, and tests, a career counselor can help you learn more about your personal likes, dislikes, and skills and how these compare with the likes, dislikes, and skills of people who work in different jobs. For example, you might find you have an interest in art, but you don’t know how you could turn it into a career. Art is a broad field with different opportunities in areas such as advertising, sales, entertainment, computer-aided design, fashion, architecture, and many others—including sculpting and painting. A career counselor can help you find a good fit. 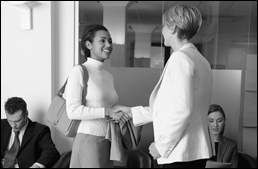 Suppose you are an outgoing person who enjoys meeting new people. You may want to go into sales. If you are a creative or artistic person who is clever with words and new ideas, advertising may be a better choice for you. If you like the idea of combining art with math and engineering, then architecture might be an area to consider. Many job placement offices offer students workshops on writing resumes, interviewing, and job search skills, including using the Internet. At many colleges, students have the opportunity to interview for jobs with hundreds of businesses, government agencies, and other organizations that come to recruit students. Most career centers have a job placement office. This office invites employers to the college to interview students. Most companies that talk to students prefer to hire those who are ready to graduate. But in some cases, companies hire students for the summer. In this way, the companies can see whether the student is someone they would want to hire for full-time work after college. Part-time or summer work, as well as special summer programs offered by many colleges, also gives students opportunities to explore whether certain jobs, careers, and companies are a good match for them. Job placement services are among the most important services offered by proprietary schools, technical institutes, and other specialized programs. Before deciding where to attend, learn about these services and the school’s success in helping students get jobs. Is College the Only Way to Prepare for a Career? In some cases, college is the only way. But for some careers, your options include vocational and proprietary schools, technical institutes, and other specialized programs. These schools often focus on specialized areas such as electronics, culinary arts, plumbing, cosmetology, and so on. Remember: No one can take education and skills away from you. The more you have, the better off you will be! - How To Choose A Present For Your Father-In-Law?